DiversityKC-ED - ALL WORLD LANGUAGES & CULTURES, INC. In my two decades of consulting in cultural competency and diversity education in schools, I have often asked school administrators, teachers and students what cultural issues they wanted to see addressed in their schools in order to better serve staff and students. That process allowed us to collect more than seven hundred questions, requests, needs and concerns all related not only to cultural diversity and inclusion education, but also in character education in. In most cases, similar concerns were expressed from urban, suburban and rural schools alike. We studied and classified these needs by categories. Today, they serve as the foundation of our cultural and character education in the numerous K-12 schools and other youth organizations that we have served. Because each school system -and sometimes school building- varies in its demographic composition and many other considerations, our approach to training is based on the specific needs of each institution. Based on our wide experience and research in both cultural diversity and inclusion, and character education, we have developed processes to educate all stakeholders in a school system from the board of education to classrooms to athletic teams. DiversityKC-ED is a cultural diversity and character education consulting process that seeks to educate and connect all the cultures in the schools, in order to guaranty harmony among all: the students, teachers, administrators, the entire institution and their community, thus leading to optimal student academic success. The bridge between cultural diversity and character education is wide and multifaceted; the line between them is often blurry. Because of the immensity of cultural and character issues in institutions like schools that welcome all qualified citizens in their walls regardless of their backgrounds, our approach has always been, as much as time and resources permit, to address and connect all the four levels of cultures and character in existence in schools: the Individual, the Team, the School, and the Community at large. That is why we have adopted the “Culture and Character Connections Model” of learning and understanding. 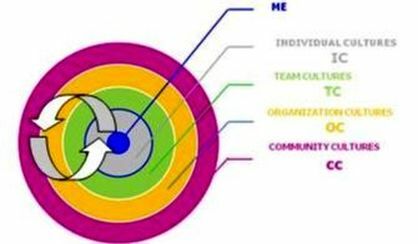 This model emphasizes the belief that individuals affect their teams, teams affect their schools which in turns affect the community. The reverse is also true. ​In addition to educating all school stakeholders in cultures and character, the other problem that DiversityKC-ED helps solve in schools is one that school leaders always wrestle with throughout the school year, and have clearly expressed their concerns to us. And that is, finding the time and the financial resources to offer quality cultural diversity education and character development to students and staff. Our answer is simple; these necessary soft skills, that are essential to each student academic success, do not need to take lots of time and financial resources to inculcate. These concepts need to be presented in a smart, practical, and efficient way based on study, skills and experience. Please check out the sample models that we offer on page 3 below. Our Philosophy of Cultural Diversity and Inclusion, and Character Education is grounded in research, our personal cultural and linguistic research, education, and experiences living and learning in three continents. Cultures influence every aspect of our lives including all our interactions with others. Character and cultural blunders often come from ignorance than from intentional malice. Cultural competency derives from the appropriate education. 2.Cultural diversity & inclusion should not be a blame game but a presentation of researched facts, of individuals’ values and background experiences; these elements explain why people behave the way they do. 3.Culture and character are two-way streets: others affect us, positively or negatively, the same way we affect them. 1.As most social sciences, cultural competency and character building are not efficient with “one shot intervention” or training that most schools adopt. There must always be follow-ups, consistency, and reminders to have the concepts settle in minds. That is why we offer a wide range of options at low costs to fit your budget. 2.Our team of composed of experienced educators and trainers have facilitated huge numbers of workshops in schools for many years. The options below give you large latitude to use us as little or as much as your resources and time permit. 3.All our sessions are very interactive, highly participatory, and efficiently help participants maximize their experiential learning opportunities. Our Team of Experienced Educators. Please Click here to see the biography of our Senior Facilitator. There is by no means an assumption that we have all the right answers. We will implement whatever process you already have in mind to address Diversity & Inclusion, Cultural Competency and Character Education. The following are concise research-based SAMPLE training modules that have been facilitated in as short as 60 minutes. These are just options. You are welcome to select from these or suggest others; we will prepare and facilitate them to your satisfaction. This session explains the generic compelling case for managing Diversity & Inclusion in an educational institution. Cultural competency starts with ME as individual. How do I develop myself to become a culturally competent educator? We enhance educators’ cultural understanding of their students in order to help them reach the higher level of diversified instructional strategies that benefit all students’ academic performance. Cultural Diversity for students must be presented in a fun and engaging manner in a way that makes sense to each of them. 6. Accepting the LGBT Students in School The issue of LGBT students and staff must be addressed in a non threatening manner to both students and staff. 7. Developing Character using Cultural Games: YAN-KOLOBA (Yan-koloba is based on research with 20,000 + participants) More than a game, YAN-KOLOBA empowers students to break cultural barriers while building cultural bridges at the same time. It helps build character; Yan-koloba reinforces respect, builds trust, responsibility, self-esteem and more. International students at all level of education are often unintentionally marginalized in school buildings. A training session will help educators better understand their fears, values and cultures in order to better respond to their academic needs. 9. Let’s Stop Bullying Before Its Gets Worse! Clear signs are visible in potential bullies before they commit bullying acts. This session starts with identifying the cultural hindrances that may limit understanding of other cultures, then suggests the strategies to develop oneself as a culturally competent individual. (Middle & High Schools)We facilitate educational sessions with selected 10th & 11th graders to empower them to assist school leaders in implementing the school diversity and character policies. As a result, they reach and positively influence their peers better than adults. Cultural misunderstandings and frictions among student athletes from various cultural backgrounds may at times lead to poor team cohesion that affect its overall performance. Training for student athletes highlights points of commonality and ends with a teambuilding activity that stresses the importance of team cohesion in the performance of the team. 13. Making Your School a Model of Diversity and Inclusion for Your CommunityA list of school-community activities are identified and implemented to connect the culture of the school with its community. One of the most important decisions we have made with school leaders has been to create “Diversity & Character Facilitators” (DCF) in each school building. One/two representatives are selected or volunteer to serve in that capacity. Our training prepare them to efficiently address cultural and character issues that often occur in schools, without adding a new thing on their plate. We use examples and short activities to bring participants to recognize their implicit and explicit biases, identify their assumptions, stereotypes, and prejudices. Participants learn simple strategies to overcome their biases by identifying and internalizing the necessary action steps. Unexpected cultural issues often occur in schools between teachers and students, among students, or between parents and the school. We have been very effective in stepping in to harmoniously alleviate these issues to the satisfaction of all parties. 18. Effective Leadership in a Culturally Diverse Educational Environment This is a cultural diversity & inclusion training session for school leaders. 19. Bullies Are There at Your Schools! Let’s Stop Them Before Someone Gets Hurt ! Teasing and bullying are more prevalent in schools than educators may want to admit; students may suffer from them but do not report. Schools should be a safe place for teachers to teach, and for students to learn and grow. This is a K-12 process. Add LANGUAGE INTERPRETING on their packages for French, Spanish or any other languages​. Note: A 40-hour agreement for 6 months will also include language interpreting in Spanish and Spanish (for IEP meetings, parent-teacher conferences, inscriptions, other meetings). This is a monthly payment of an agreed dollar amount, thus making the consultant available promptly upon request for any task listed in the agreement. Note: A retainer Contract for 12 months will also include language interpreting (for IEP meetings, parent-teacher conferences, inscriptions, other meetings) for Spanish, French and other languages available at minor extra charge. $.55 per mile (per GSA or AAA rate) per travel after 50 miles round-trip (per GPS). ​​$500 per hour with up to 1 month to complete. ​$450 per hour with up to 1 month to complete. $300 per event with up to 6 months to complete. $250 per event with up to 12 months to complete. We are also available to meet with your team. A SERVICE OF ALL WORLD LANGUAGES & CULTURES, INC.